Mason Engineering products are 100% AMERICAN MADE and use DOMESTICALLY PRODUCED ALLOY MATERIALS. At Mason Engineering we DO NOT outsource our manufacturing and have no plans to in the future. With the expansion of the popularity of our products, companies in China have started copying and mislabeling their cheap knockoffs as our bars. We want you to be 100% satisfied and we do our very best to provide you with the best product available. Our preferred material is aluminum because it is one third the weight of carbon steel and is twice as strong in a compression load situation. The advantage of aluminum is it is light, and non-magnetic. This means that electrical disturbances are reduced, and it resists corrosion. In its natural state, aluminum has a clean appearance and absorbs impact loads without permanently deforming as aluminum has a high modulus of elasticity. Additionally, Aluminum has a 45k PSI tensile strength. Carbon Steel on the other hand is overall stronger in all directions of load but is three times as heavy, is prone to oxidation (rust), and is magnetic. Carbon Steel has a 55k PSI tensile. What is the physical proterties of your material? As you can see from the graph, stainless steel is in the weakest of the lot but is good when used in heat affected areas. Aluminum alloys typically have an elastic Young's modules of about 79G Pascals which is about one third of the elastic modulus of most kinds of steel and steel alloys. Therefore, for a given load, a component or unit made of an aluminum alloy will experience a greater elastic deformation than a steel part of the identical size and shape. Through there are aluminum alloys with somewhat higher tensile strengths than the commonly used kinds of steel, simply replacing a steel part with an aluminum alloy might lead to problems. In general, stiffer and lighter designs can be achieved with aluminum alloys than is feasible with steel. For instance, consider the bending of a thin walled tube: the second moment of area is inversely related to the stress in the tube wall, i.e. stresses are lower for the larger values. The second moment of area is proportional to the cube of the radius times the wall thickness, this increasing the radius (and weight) by 26% will lead to a halving of the wall stress. For this reason, bicycle frames made of aluminum alloys make use of larger tube diameters than steel or titanium in order to yield the desired stiffness strength. In automotive engineering, cars made of aluminum alloys employ space frames made of extruded profiles to ensure rigidly. This represents a radical change from the common approach for current steel car design, which depends on the body sheel for stiffness, that is unibody design. 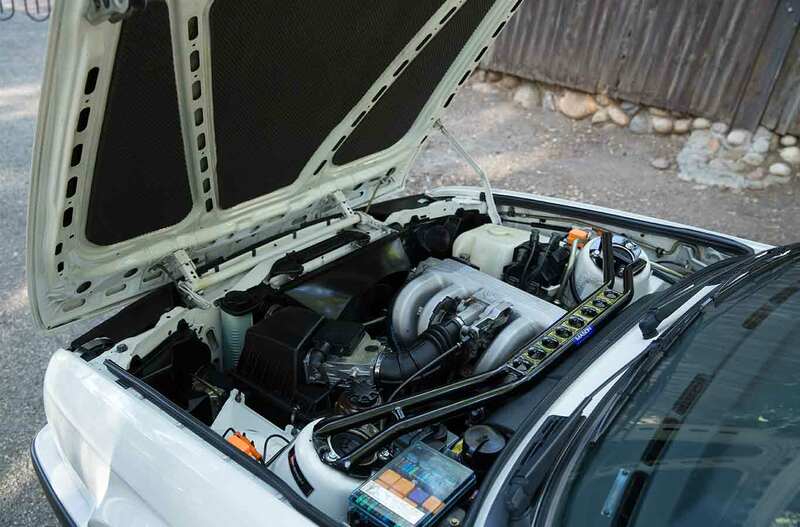 Why do you need a strut bar? The BMW 3 Series cars are well known for their agility and superb handling. However, because of the chassis design, there is a weakness in the 3 Series cars. The front shock towers are not well supported in the 3 Series chassis. In fact, they are somewhat isolated and unsupported. As a result, the towers can bend and flex under heavy cornering. This flexing can cause detrimental changes in the handling of your car, because, in general, the stiffer the chassis, the better the handling of the car. Camber strut braces are designed to maintain the distance between the shocks under heavy cornering. A bar linking the top of the shock towers ensures the towers do not bend when the chassis is flexing. The strut bar, strut brace, or strut tower brace (STB) is a mostly aftermarket car suspension accessory usually used in conjunction with MacPherson struts on monocoque or unibody chassis to provide extra stiffness between the strut towers. With a MacPherson strut suspension system where the spring and shock absorber are combined in the one suspension unit, the entire vertical suspension load is transmitted to the top of the vehicle's strut tower, unlike a double wishbone suspension where the spring and shock absorber may share the load separately. In general terms, a strut tower in a monocoque chassis is a reinforced portion of the inner wheel well and is not necessarily directly connected to the main chassis rails. For this reason, there is inherent flex within the strut towers relative to the chassis rails. A strut bar is designed to reduce this strut tower flex by tying two parallel strut towers together. This transmits the load of each strut tower during cornering which ties the two towers together and reduces chassis flex. To accomplish this effectively (especially on MacPherson strut suspensions), the bar must be rigid throughout its length, and also attached to the firewall. Why you need a rear shock tower bar? The purpose of a rear shock tower bar is to reduce the amount of flex that the chassis experiences during cornering by bracing the tops of the struts and the strut towers against each other. A strut brace results in a more rigid chassis with less flexing and twisting, which translates to a more confidence-inspiring driving experience. A rigid chassis is more responsive, whereas excess movement and flexing can make a vehicle feel loose. The rear shock tower bar will also help to remove the common unwanted front end under steer associated with excessive body roll. Will you need to have your car realigned after installing a strut bar? When you install the strut bar you are doing so with the suspension fully loaded due to the car being on the ground. No movement will occur on the suspension during install, which means you will not affect your alignment. Will installing Mason Engineering parts on my vehicle affect my warranty? Mason Engineering is not an endorsed manufacturer of BMW parts and accessories. No warranty for our parts will be provided by BMW or their affiliates. Installing Mason Engineering parts on your BMW could possibly violate or void the manufacturer's warranty. All liability is assumed by the customer. BMW has manufactured thousands of cars and they are not all exactly the same. This is called manufactures tolerance. With age and mileage use the chassis strut towers migrate or change location after years of use, this is called cyclic tension compression load which cause tolerance variation. In some cases this can cause assembly problems installing our strut bars. Mason Engineering manufactures our products to be compatible to mount with tight tolerances to OEM specifications. How critical is the tension force pulling on the outer towers? Even though the strut tower is designed mainly to manage vertical forces and to provide a load path for tensional and compression loads, the problem is that this force is repeatedly applied over many cycles during the life of the car. The more the car is driven the more cycles you generate. This can lead to fatigue failure of the material that forms the strut tower. The strut bar ties the two strut towers together so they share the common load applied at the outer tower. A strut tower bar shows a tendency to be in tension and compression and some amount of twist. The strut bar is designed to provide a load path to dissipate fatigue stress in this area. This will give twice as much material to deal with the same corning force and helps fatigue stress in this area. Copyrights © 2018 Mason Engineering. All Rights Reserved.